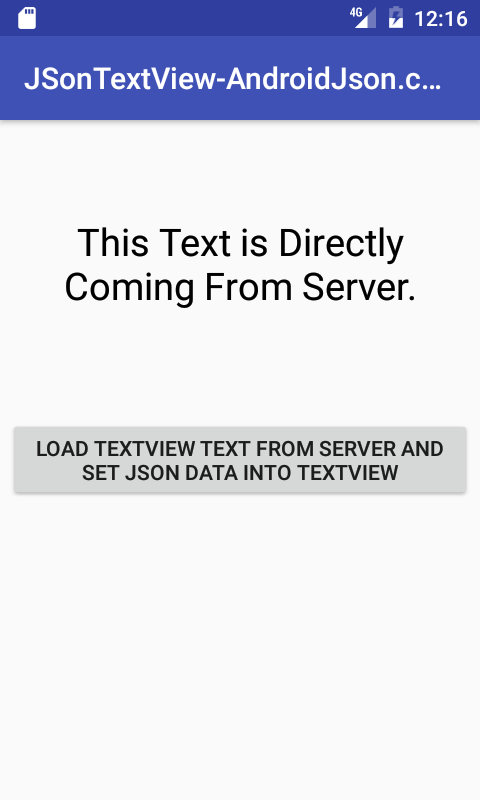 How to Make TextView at application run time programmatically using Server JSON Parsing MySQL data Example Tutorial. In this tutorial we would going to create an android application which has contain dynamic TextView, means the text set inside TextView would directly come from our online web hosting server already store in MySQL database and parsed using PHP. So here is the complete step by step tutorial for Android Create Dynamic TextView Using PHP MySQL JSON Data. Create a database on your server including Table. Create and upload PHP files on your server to parse MySQL data into JSON form. Start a new android app project. Add internet permission to your AndroidManifest.xml file. Add Org.Apache.Http.Legacy library in your project . After seeing the demo video next step is Create a fresh database on your hosting server, inside that database create a table named as TextViewTable. Inside that table create two columns id and TextViewServerData like i did in below screenshot. After inserting data into table we need to crate the PHP script which would parse the MySQL data into JSON from. So below is the PHP Code. Next step is to start a fresh android app development project or open your existing project in which you want to implement dynamic TextView. Open your project’s AndroidManifest.xml file and put the below internet permission inside it. You can find complete AndroidManifest.xml file source code at the last of this page. 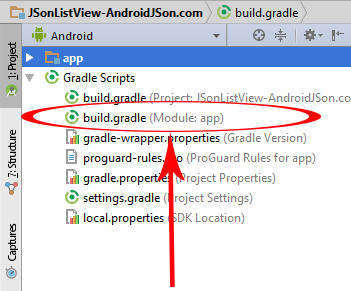 Open your project’s build.gradle(Module:app) file . 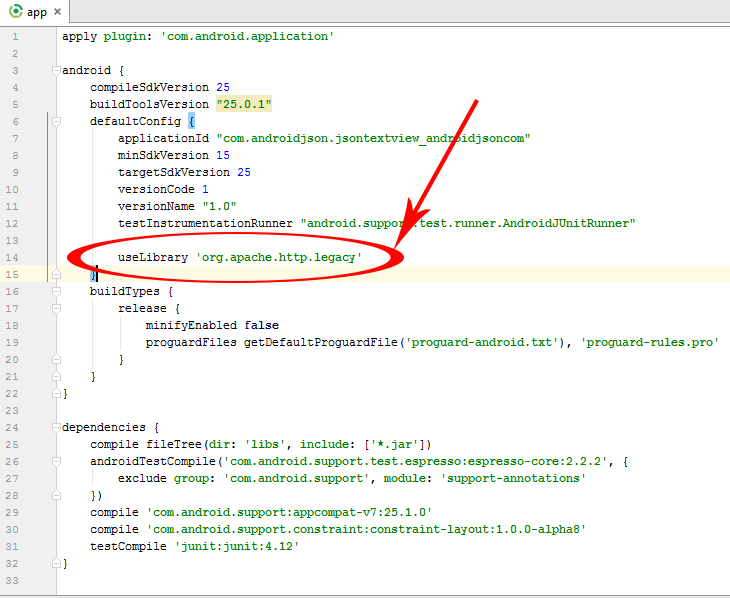 Inside the android scope put useLibrary ‘org.apache.http.legacy’ like i did in below screenshot. // Adding HTTP Server URL to string variable. // Assigning ID's to button, textView and progressbar. // Adding click lister to button. // Showing progress bar on button click. //Calling GetDataFromServerIntoTextView method to Set JSon MySQL data into TextView. // Declaring GetDataFromServerIntoTextView method with AsyncTask. // Adding HttpURL to my HttpPost oject. // Passing string holder variable to JSONArray. // Adding JSOn string to textview after done loading. //Hiding progress bar after done loading TextView. 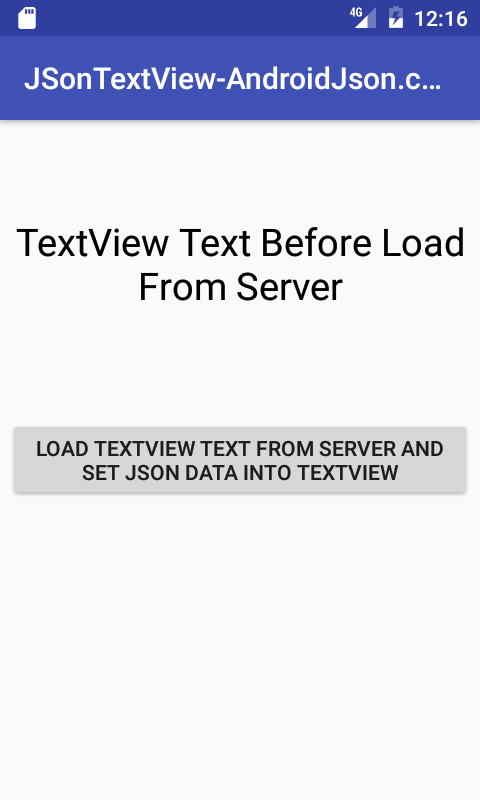 android:text="TextView Text Before Load From Server"
Click here to download Android Create Dynamic TextView Using PHP MySQL JSON Data project with source code.